Simply click the location below for service times and more info. Regardless of which campus you attend, you are welcome and wanted! Dress any way that is comfortable for you. People dress in a variety of ways - very casual to Sunday best. Feel free to come as you are! Want to see what you can expect in a service? Click to watch our latest service below. We have a state-of-the-art facility for your child! This facility is shared by the Original and Branch campus locations. Our Macon Campus has a matching area at their brand new location that your child will absolutely LOVE! For the Original, Branch and Macon campuses you will find parking attendants to help you easily find a spot. For the Impact and Forsyth campuses, spots are readily available and located close to the entrances! Headed to our Original Campus or Branch Campus? 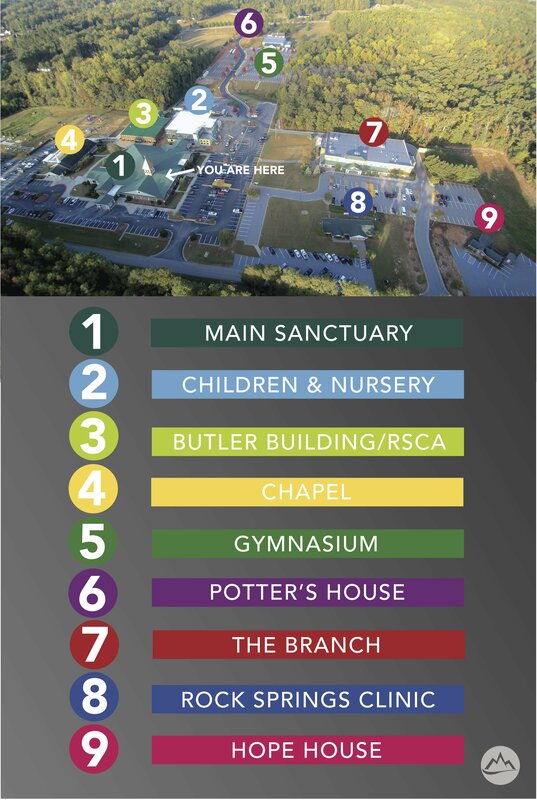 Click below to see a campus map!